I’m in the kitchen getting ready to start our feast. 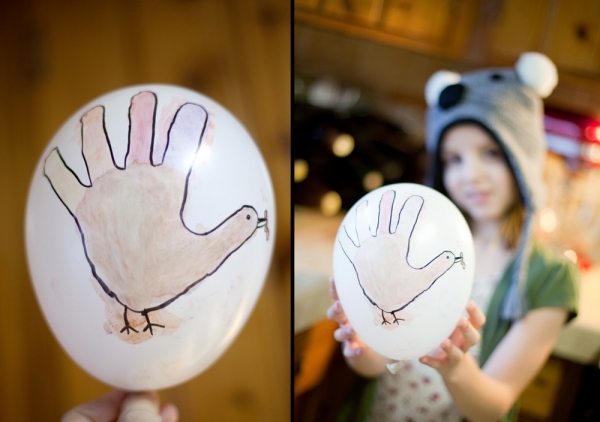 We opted to stay home this year and celebrate with just our kids. It wasn’t an easy decision, but honestly, we have been absolutely swamped with the studio and the “down time” was hard to resist. 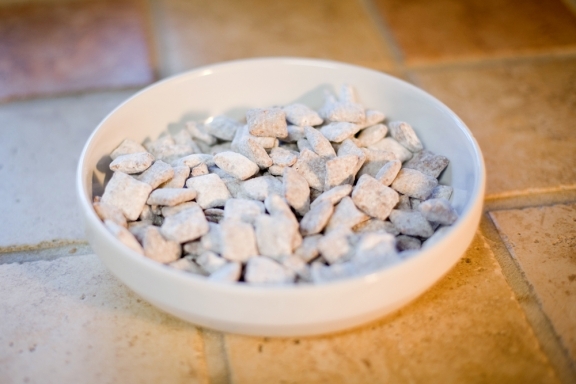 The puppy chow was made the night before Thanksgiving and half of it already consumed after the kids went to bed. I had done the mental math in my head and asked Jason how it felt to have consumed about 3/4 cup of powdered sugar. He gave me a strange look and told me not to inform him of such things again. present — how cute is that? After lunch, we decided to set up the tree. Jason set up his GoPro for a little stop action video of the event. After lunch, we did a project with the kids. I had seen something similar on Pinterest. I want to be crafty, really I do. There are so many ideas out there, yet when I try to apply them they never seem to turn out just right. (You should see the felt owl “lens buddy” I tried to make for our cameras. It was the scariest owl ever.) This one seemed easy enough — except for poor Abbie. I didn’t think about how hard that silly “A” would be to wrap with yarn. Oops! They all seem happy with the door hangers however, and I guess that’s what matters the most! And finally, to the meal of the day. We made turkey and ham, however it was the side dishes this year that stole the show. I don’t know how many kids out there ask for brussel sprouts, but (the majority) of ours do. And in all fairness, those that don’t claim to not like any veggies at all. I am of the opinion that anything coated in Parmesan and sauteed in butter has no choice but to be delicious. And pumpkin pie. YUM. Don’t forget the mashed potatoes. Double Yum. We ended the day with a little game of Candy Land, Dora the Explorer style. Grandma and Grandpa came over for a bit in the evening and we didn’t have enough characters so the kids raided their rooms for alternate players. I was a squishy pig, Chris was Mario and Abbie was a star. Abbie won the game and Emma came in second. All in all, a pretty spectacular day!